This June, Hollins University will be hosting a Women Working with Clay symposium at their Roanoke, Virginia campus. I’m happy to announce that gallery artist Cheryl Ann Thomas has been invited to participate in the symposium as a faculty demonstrator. 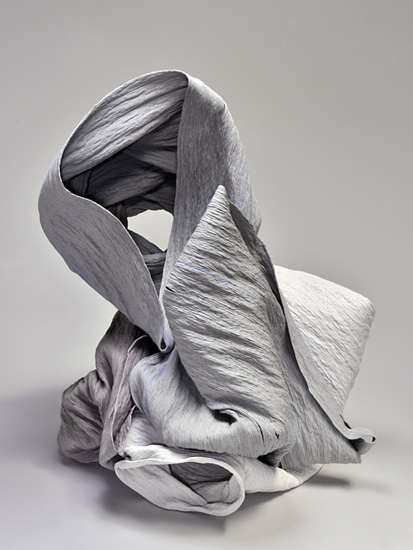 The symposium will address the tradition of women in ceramics as potters, artists, and artisans. The following video, titled Relic 250, resulted from Cheryl Ann Thomas’s desire to share her process. I think it elegantly illustrates the work that goes into each piece, and serves as a meditation on the delicacy and transience of life and art. As the exhibition Ken Price Sculpture: A Retrospective makes its way to its third and final destination – The Metropolitan Museum of Art – I find myself reflecting on Ken Price’s history with the gallery. We’ve shown his work many times over the years, in both solo and group exhibitions. Looking back through our archives, it makes me happy to see the wide range of his works that we’ve presented. 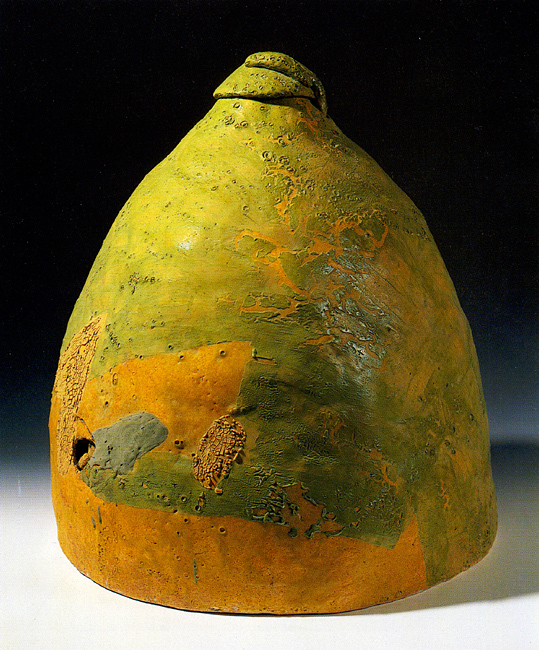 I first had the pleasure of exhibiting Price’s work in 1998 in an exhibition titled John Mason, Ken Price, Peter Voulkos. The show included an Untitled Mound from 1959, a historic work that had been featured in the artist’s first solo show at the Ferus Gallery in 1960. A very similar piece was more recently on view at the Williamson Gallery at Scripps College for their 2012 exhibition Clay’s Tectonic Shift: John Mason, Ken Price, and Peter Voulkos, 1956-1968. 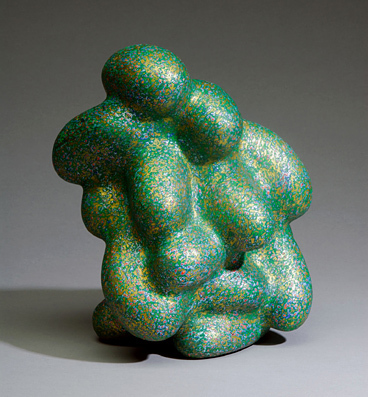 Since then, I’ve exhibited a diverse mix of Ken Price’s work, including a 1970s geometric cup, selections from his Happy’s Curios period, a series of plates from the 1990s, and his more recent, brilliantly colorful, biomorphic forms. In addition to an intimate survey of small ceramics, the gallery’s latest show of Price’s work displayed examples of his print-making activities, in the form of large lithographs and silkscreens. I wanted to document the 2012 show in a more personal way, so I asked Larry Bell, a good friend and peer of Ken Price, to lead an exhibition walk-through of the show. I’ve posted this video before but think it’s worth repeating – Bell’s sincere and insightful commentary about the artist and his work is a pleasure to hear. Perceptual phenomena—especially visual phenomena—are the central focus of many Los Angeles artists’ work, rather than the material processes they use to achieve their goals. 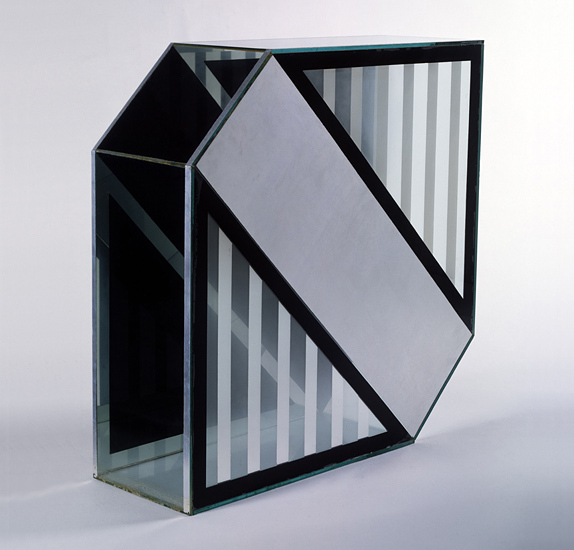 For example, I sometimes see writers link Larry Bell’s work in glass to the hot-rod car culture of Southern California. However, the obsession with perfect, gleaming surfaces relates only superficially to Larry’s interests. He never drove a hot-rod or participated in car culture, and was involved in the folk music movement of the late 50s, hardly a “slick” scene. But Larry was there at the leading edge of artists’ investigations into visual perception. Some of the most interesting origins of the movement are experiments that Turrell and Robert Irwin participated in with the late Edward Wortz, who was then working at Garrett AiResearch in aerospace perceptual psychology. As cited in Lawrence Weschler’s book Seeing is Forgetting the Name of the Thing One Sees, there was also a conference of architects and experts that was held in Venice in 1970, titled “The National Symposium on Habitability”. 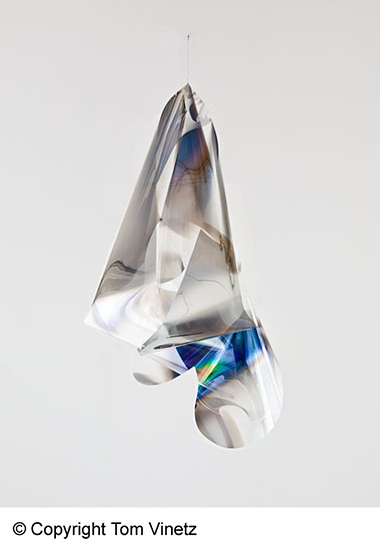 Larry Bell created two different rooms in his Market Street studio, which explored the concept of habitability. The first of these spaces was described by Wortz as “so oppressive that it was never used. 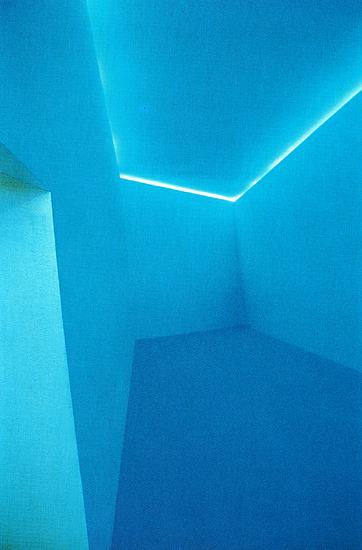 People would just go in, turn around, and leave.” He constructed the second room with walls which were “angled in such a way as to render the space extremely reverberant, so that people kept having to scoot their chairs closer and closer in order to hear one another.” Bell also designed and installed the “Blue Room” (pictured on the right), which has been re-created for MOCA and for his survey show in Nîmes. Larry’s work, like that of other artists who are often placed in the Light and Space movement, focuses on awareness of human perception. 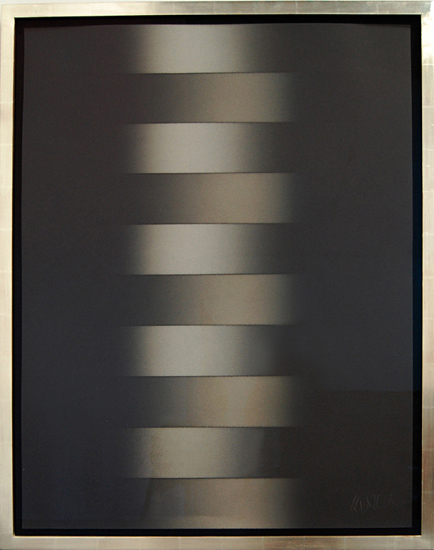 Whether he was creating the illusion of volume in paintings, constructing experimental environments, or using metallic particles to interfere with the passage of light through glass, Larry’s work defies our expectations. By asking viewers to reconsider what they’re looking at, his art creates a perceptual experience that allows us to see the work, and the world, in new ways. Schuld, Dawna. “Practically Nothing: Light, Space, and the Pragmatics of Phenomenology.” In Phenomenal: California Light, Space, Surface. (Berkeley and Los Angeles: University of California Press, 2011), 109. Weschler, Lawrence, quoting Edward Wortz. Seeing is Forgetting the Name of the Thing One Sees. (Berkeley and Los Angeles: University of California Press, 1982), 132-133. Hanor, Stephanie. “The Material of Immateriality.” In Phenomenal: California Light, Space, Surface. (Berkeley and Los Angeles: University of California Press, 2011), 128. Today I am opening a new exhibition of recent works by Larry Bell at the gallery. The show includes 22 Small Figures, a luminously beautiful series of collage works as well as selected examples of Light Knots, a series of three-dimensional kinetic sculptures. These sculptures derive from Larry’s current collages, a kinship reflected in their shape and composition, as well as their materials. Light Knots begin their lives as sheets of Mylar film, which Larry cuts, folds, and coats with vaporized metallic particles. Hung from the ceiling with monofilament, the nearly weightless works sway with the slightest air movement. Their iridescent layers shift and shimmer in the light, reflecting the surrounding environment. Like the collages, the appearance of the Light Knots shifts dramatically depending on the ambient light and the viewer’s position towards them. According to Larry, “the colors you see are not pigments, they are what is known as interference color…the same as a little gas on a puddle of water at a filling station.” The surfaces of the Knots transmit, reflect, and absorb light, continuing the artist’s lifelong fascination with the nature of perception, and how to manipulate its properties. Here’s a video filmed and produced by Ollie Bell, which really captures the beauty of the Light Knots. Light Knots from Ollie Bell on Vimeo.